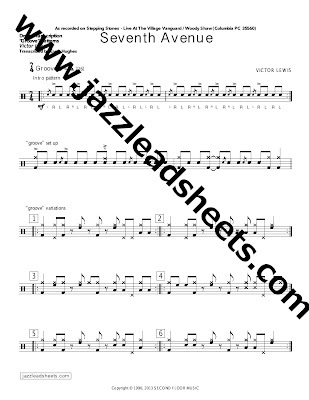 Drum Transcription: Two transcriptions of variations on Victor Lewis' "grooves" from two different recordings of his composition "Seventh Avenue"
Description: In talking to Victor Lewis about how best to use these transcriptions, we decided that instead of transcribing his playing throughout the entire head, it would be more important to focus on developing the basic groove, then learning to use it in a musical setting. 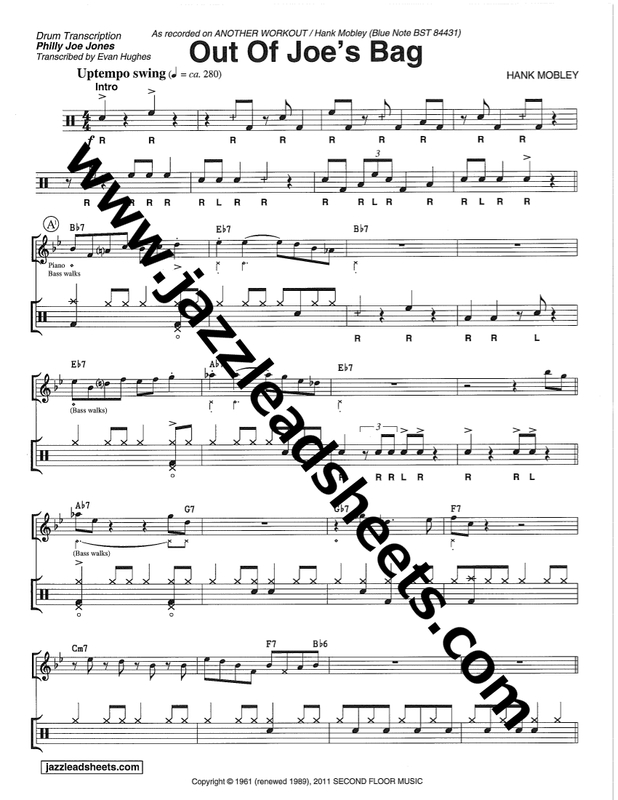 These transcriptions are designed as worksheets. 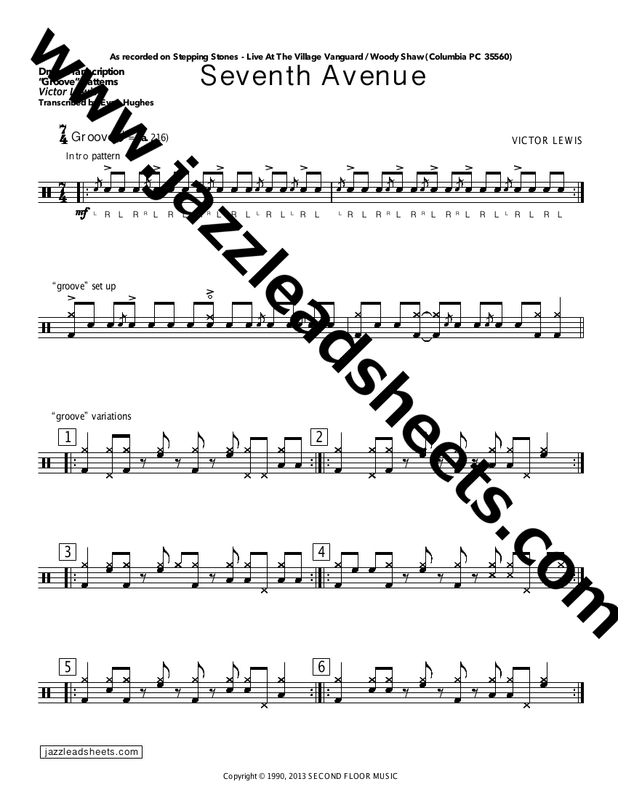 Learn each groove pattern one at a time and be able to repeat them. They were taken directly from the recordings because they were some of Victor's most commonly used grooves in those recordings. When you're able to play them correctly, try playing along with the recordings to hear how Victor uses them in the music. It's also interesting to look at the two recordings side by side and notice the similarities and differences. These two recordings were almost 20 years apart. Check out Victor Lewis as he talks about composing Seventh Avenue and playing it with Woody Shaw the first time on our YouTube Channel. Philly Joe Jones Drum Transcription: "Got to Take Another Chance"
Drum Transcription: A six-page in-depth drum transcription of everything Philly Joe Jones plays on his own composition, Got to Take Another Chance. Description: The recording, "Philly Joe's Beat," displays some of Philly Joe's finest work as a bandleader. 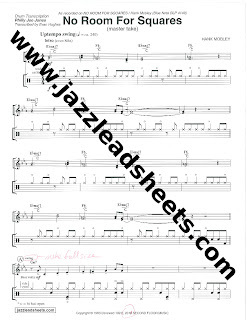 This is the first transcription of Philly Joe Jones on jazzleadsheets.com where he is featured on his own composition. Many of the legendary drummers recorded often as sidemen, but when it was time to lead their own band in a recording date, they needed to somehow elevate or distinguish their playing. Not by overplaying or playing louder, but by playing like the man in charge. Pay close attention to how Philly Joe sets up the quintet throughout this song. His drum solo features some of his most characteristic stickings and phrases. 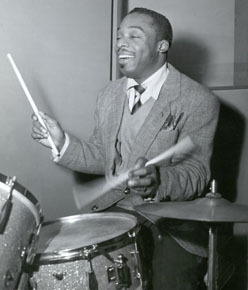 In a serendipitous coincidence, "Philly Joe's Beat" was recorded on Victor Lewis' (another master drummer) tenth birthday. A rare recording of Billy Higgins, talking with Rudy Van Gelder and Don Sickler about the great tenor saxophonist Dexter Gordon. 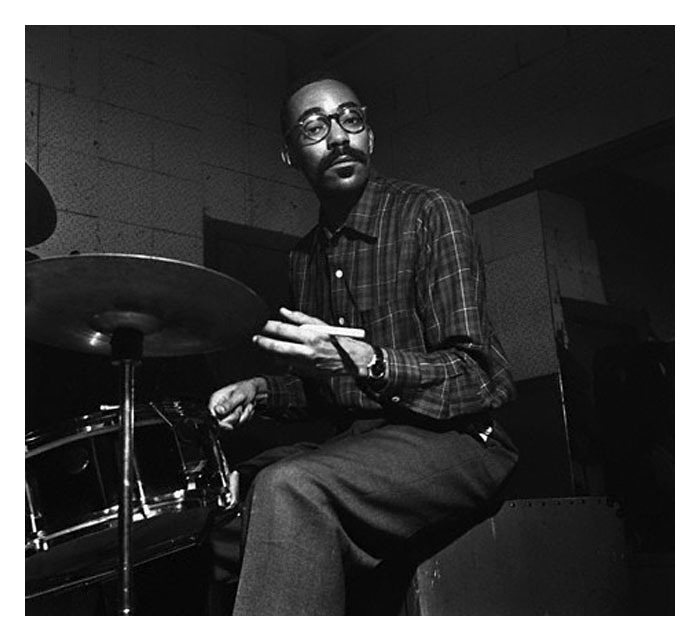 This conversation was recorded in 1998, at Rudy Van Gelder's studio in Englewood Cliffs, New Jersey, where Higgins recorded countless great records. 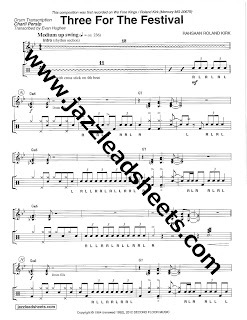 Charli Persip Drum Transcription "The Eternal Triangle"
Drum Transcription: A six-page in-depth drum transcription of drummer Charli Persip playing on the famous recording of The Eternal Triangle. Description: The Eternal Triangle is perhaps the most famous “tenor battle” of all time. Sonny Rollins and Sonny Stitt certainly take it to the next level on this recording, but not without the help of the great Charli Persip. This transcription features some of Charli’s most fierce and energetic playing. His fours with longtime musical partner Dizzy Gillespie are not overshadowed by the tenor battle, as Charli Persip is a strong soloist in his own right. 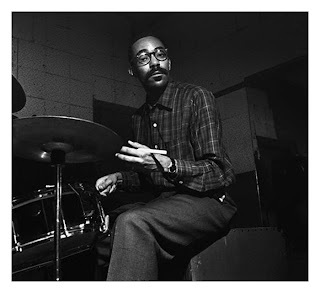 Historical Notes: By 1957, Charli Persip (then known as "Charlie") was a much in-demand drummer for recordings and performances, both in small groups and in big bands. His first recording in 1957 was on February 18, a Lee Morgan/Wynton Kelly Septet date for Specialty records. Nine days later Charli and his Jazz Statesmen became part of Howard Rumsey and his Lighthouse All-Stars, recording for Liberty Records. On March 23, he did the first of seven sessions with Dizzy Gillespie's big band before the "Sonny Side Up" session. Sandwiched in between these session he still found time to do sessions for Lee Morgan, Ernie Wilkins, Don Bagley, Eddie Chamblee, six Dinah Washington sessions, and Benny Golson's "New York Scene" (see Something In B-flat). Obviously Charli was a very busy young man in 1957. Now, give yourself a real treat--listen to and watch Charli tell you about his experience at The Eternal Triangle session. The full sextet arrangement of The Eternal Triangle is available for purchase at HalLeonard.com and other music distributors. 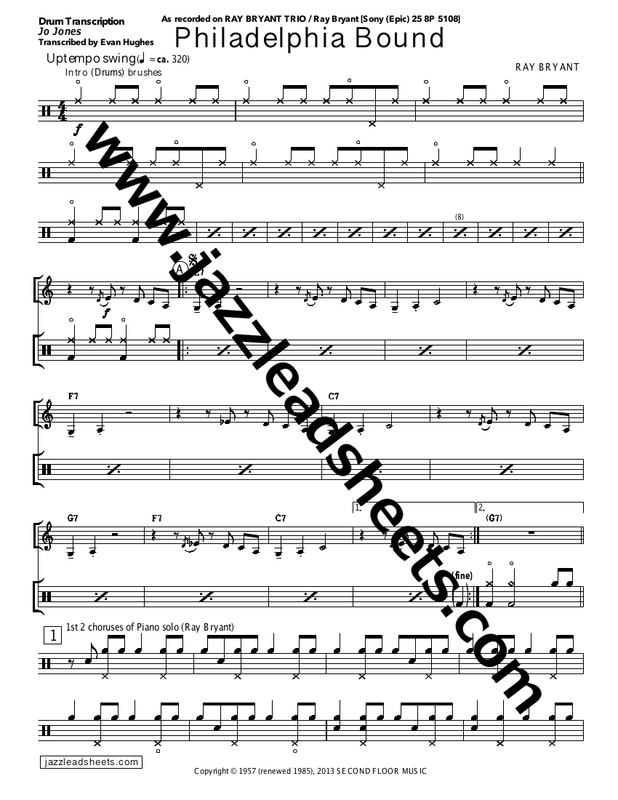 Billy Higgins Drum Transcription: "Benji's Bounce"
Drum Transcription: A seven-page in-depth drum transcription of Billy Higgins on Dexter Gordon's Benji's Bounce. 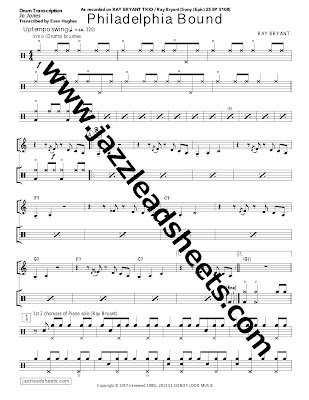 Description: This transcription includes a lot of Billy Higgins solo material. Though mostly known for his signature "groove" on many classic Blue Note albums, Higgins' soloing is not to be overlooked. It is tasty, always grooving, and very much unique to his style. The musical relationship between Billy and Dexter is evident throughout the track, but their interaction in the trading section is very special. Dexter was living in Europe at the time, and this recording features two European musicians, Tete Montolio (Spain), and Neils-Henning Orsted Pedersen (Denmark), alongside Higgins. 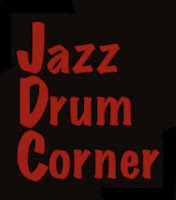 To hear Billy talking with engineer Rudy Van Gelder and Don Sickler about Dexter Gordon, click here. 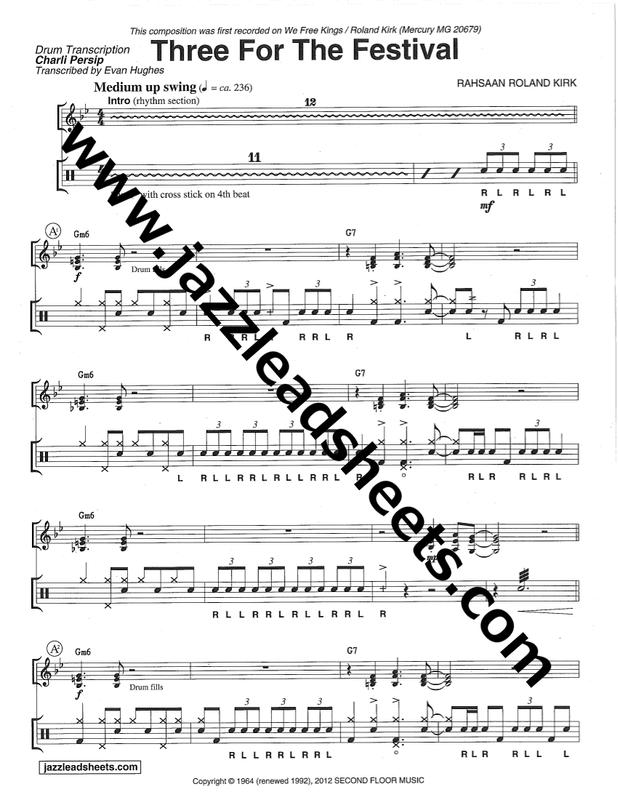 Papa Jo Jones Drum Transcription: "Philadelphia Bound"
--Drum Transcription: A four-page in-depth drum transcription of “Papa” Jo Jones playing brushes on Ray Bryant’s "Philadelphia Bound." 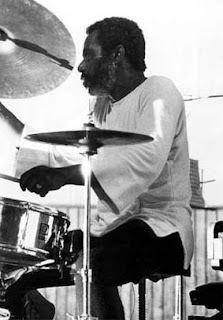 --Description: Any great jazz drummer will tell you that “Papa” Jo Jones helped write the book on playing brushes. Countless well-known jazz drummers cite this particular recording as their bible of brush playing. You can hear the articulation of his brushes very clearly, and his feeling is so strong. 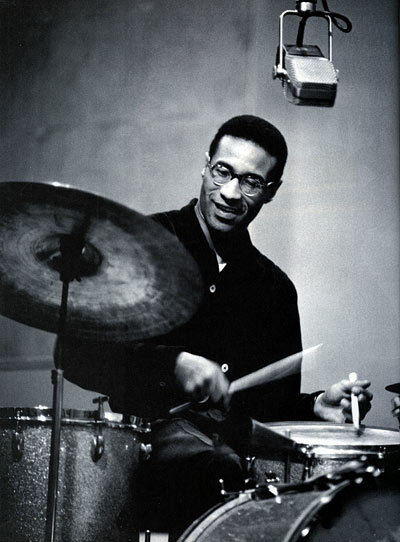 The tempo is extremely fast, but Jones plays it with relaxed ease and the group follows his lead. 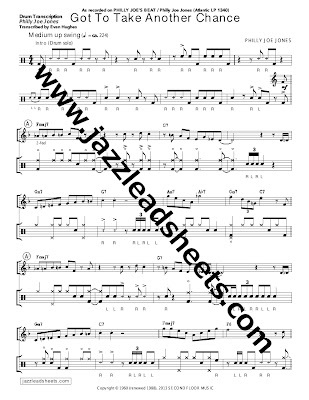 This transcription also showcases Jones' solo talents and demonstrates why his style of playing would be so influential on the drummers who followed. 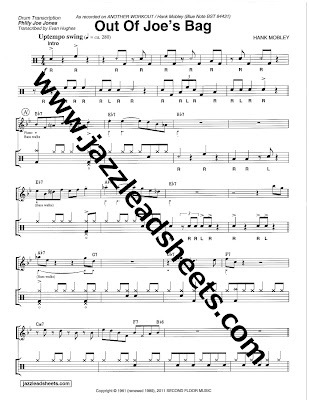 As you work through this transcription, try to emulate Jones’ sound on the drum: the dynamics and “touch” of his accents. 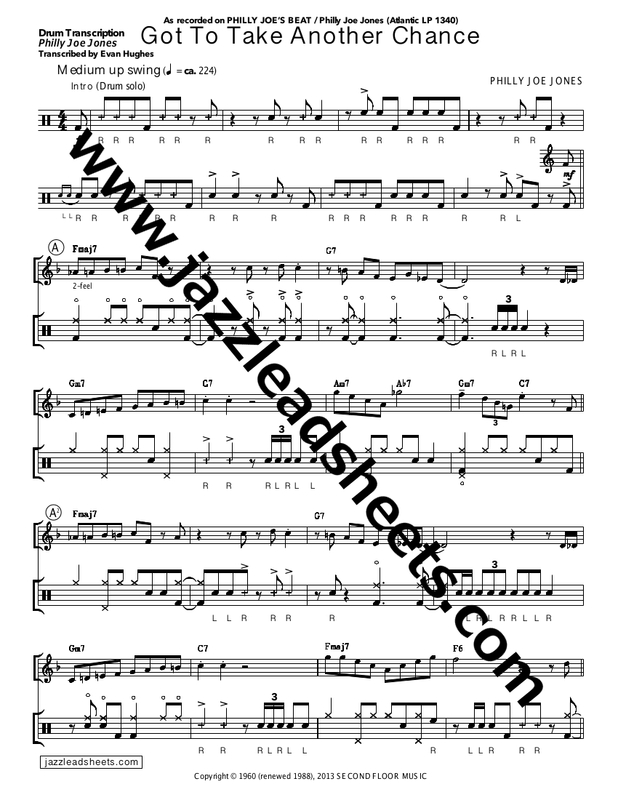 Charli Persip Drum Transcription - "Three For the Festival"
Drum Transcription: A four-page drum transcription of Charli Persip's playing alongside Rahsaan Roland Kirk on Kirk's composition Three For The Festival. Description: Charli Persip said that he clearly remembers the day of this recording session. He was with Elvin Jones right before the session, who told him to "always play with open ears, always play like yourself and don't worry about anything else." Charli himself cites this session as some of his favorite playing. Note how well he sets up the hits in the melody, and how he responds to Rahsaan's unorthodox and intricate playing. You can see Charli and hear some of his stories on jazzleadsheets YouTube channel. 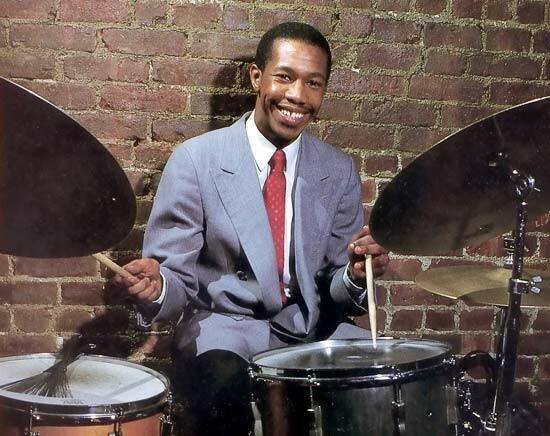 Description: Similar to other drum features that Mobley composed, Workout is all about Philly Joe Jones. It features Philly Joe playing around the call-and-response melody, as well as an extended three-chorus drum solo. This solo features some of Philly Joe's most distinguishable and swinging phrases perfectly placed to move the music forward. A nice video from Paris 1959. 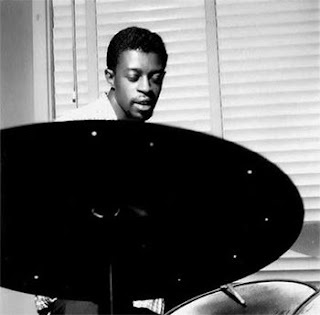 Kenny Clarke was in my opinion perhaps the best brush player (up there with Papa Jo Jones of course). If you doubt it, then download "Dîner Au Motel" from Miles Davis' Album "Ascenseur Pour L'échafaud." His feeling with the brushes is incredible, and the sound and ease at which he does it. This video has great trio playing from Bud too, check out the ending! All drummers should practice soloing over a walking bass line. 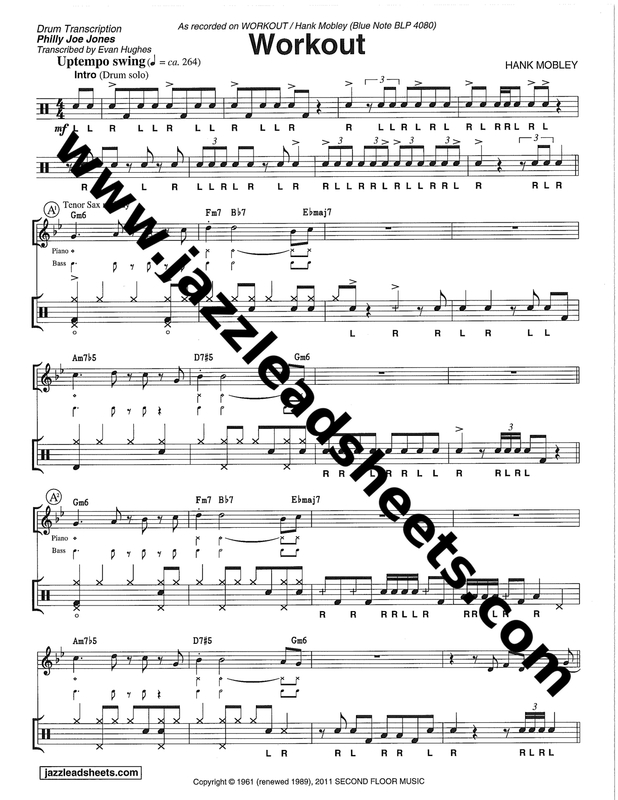 Is is a great exercise because it forces you to keep the time and groove constant throughout your solo, and it also gives you a clear context to hear a drum solo in relation to the harmonic implications of the song. Here is a great video from one of our modern masters of jazz drumming, Greg Hutchinson. Of course Greg's technique is flawless, but also listen to how strong and musical his phrases are over this Blues form... "Theme and Development." A great clip today from master organist Jimmy Smith with Quentin Warren and the great Billy Hart. 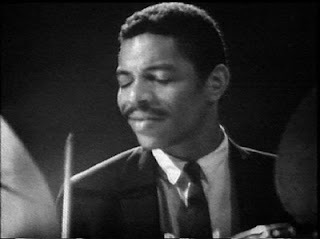 This is great old footage of Billy Hart that I particularly like because of how light and "tippin'" his cymbal beat is. I have always found that playing with an organist and no bass player is especially challenging because there is no attack to the bass notes, so it's easy to feel like the bottom is lost. What that means is that the great drummers who have made an organ trio swing have an incredibly strong quarter note in their cymbal beat. 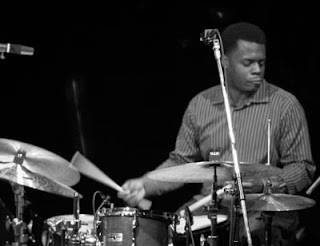 Billy Hart is appearing this week at Dizzy's in NYC with his quartet featuring Mark Turner, Ben Street, and Ethan Iverson. It is one of my favorite groups playing right now make sure to check it out! This week, the rudiment of the week practice is the "Alternated Cheese Pataflafla." The double flam followed by the double stroke makes this rudiment particularly tricky, but a good way to increase flexibility and quickness. I recently discovered a great record called the "Ray Bryant Trio," with Ike Isaacs on bass, and Charles "Specs" Wright on drums, recorded in 1957. I had heard Ray on two of my all-time favorite drum records, "Papa Joe Jones Trio" and "Max Roach +4," but this record is much different, very mellow and tasty, with some nice brush playing by Charles "Specs" Wright. I spent the afternoon today at Rudy Van Gelder's studio in Englewood Cliffs, New Jersey. It's amazing to be in the room where so many incredible musicians recorded so many incredible albums. John Coltrane's Ballads, and A Love Supreme, Joe Henderson's Page One, Kenny Durham's Una Mas, and so many more. Then I took a look at the 7-foot Steinway in the big room, which was the piano that Thelonious Monk, Bud Powell, Duke Ellington, Herbie Hancock, and essentially every other important pianists played on. It is still in pristine condition, but it holds so much history and so many amazing musical moments. Being in that room made me think of the story that Charli Persip told about being at a recording session of Miles Davis' with Milt Jackson, Thelonious Monk, Percy Heath, and Kenny "Klook" Clark, where Monk spills a beer in the middle of a tune. 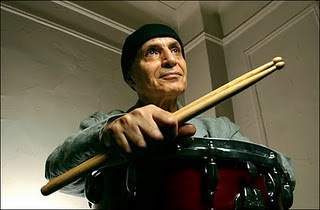 There has never been another drummer like Paul Motian. There has never a drummer so unique, creative, beautiful, swinging, abstract, soulful and everything else. To me Paul represented perhaps the most beautiful lesson in music; keep searching. He continued to re-identify himself throughout his musical career. 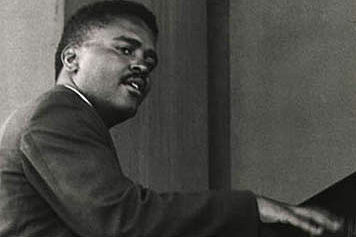 His influence on the international jazz scene, but especially the New York jazz scene was profound. 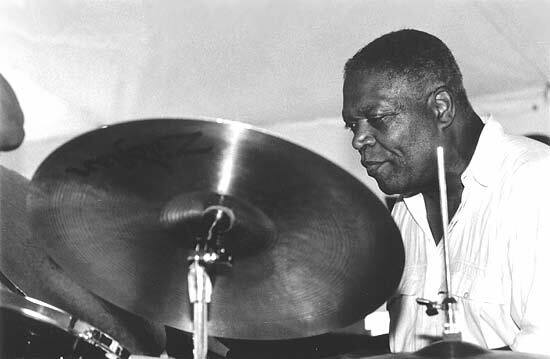 He provided that bridge between generations that lacks so much in the jazz today. Through bands such as his trio with Bill Frisell and Joe Lovano, the Electric Bebop Band, and every other assortment that he recorded with and brought the Village Vanguard so consistently, he exposed some incredible musicians to the world, and some incredible music. For the next week, there will be many posts revisiting some of Paul's most important work. Rest in peace Paul, you will be missed deeply. The rudiment of the week this week is the Flamill Drag. This one is a particular tongue twister, at least for me, partly I think because it stays with one hand for the 16th notes after the flam. This one can also be embellished with more added flams to change up the tone, and also make it more challenging. Remember to start slow and build up to a comfortable speed. What a force behind the kit! Absolutely incredible footage. His time feel is so unique and abstract, but unbelievable how much he moves the music forward. Can't get enough of it! Also check out how the drum set gets away from him during the drum solo, it's happened to all of us, right?! 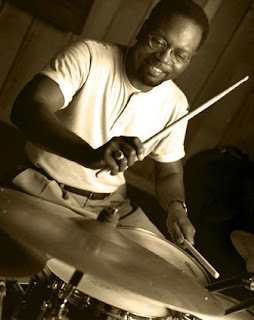 When most of us practice jazz independence exercises, we most often times stick to the typical ride cymbal pattern. What I found to be surprisingly challenging is to change the ride cymbal pattern just slightly, and try again at some comping rhythms with the snare and bass drum. In these "Ride Cymbal Variation" posts I will supply some examples of an altered ride cymbal pattern to try different comping exercises out of. 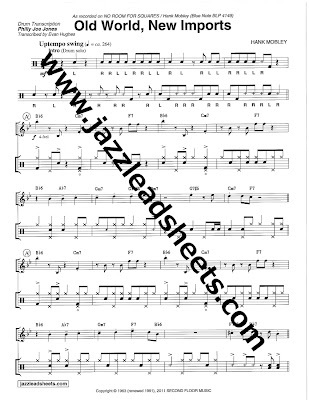 A great place to look for comping rhythms is John Riley's "The Art of Bop Drumming," but you can create your own just as well. 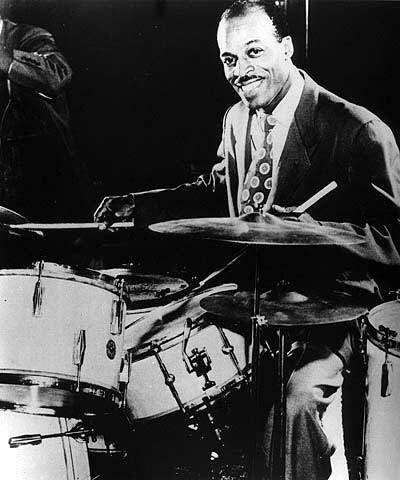 Some hard swinging stuff today from one the all-time greats, Papa Jo Jones, shown here in this video with the Basie band. Incredible soloists from Ben Webster, Coleman Hawkins, Gerry Mulligan, Roy Eldridge among many others. Talk about a strong beat! You can't help but tap the foot on this one. Check back soon for some Papa Jo Jones transcriptions! 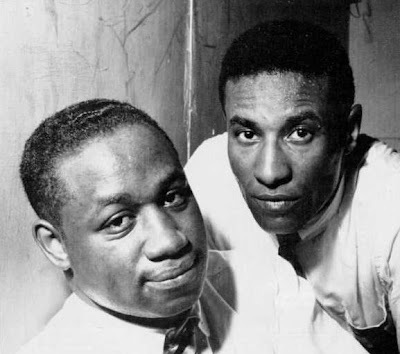 Some nice sounds from on the most profound groups in jazz history Clifford Brown & Max Roach Quintet, the song "Gerkin for Perkin." This song is a particular favorite of mine, specifically because it has demanding rhythmic interplay between the rhythm section and the horn melody. 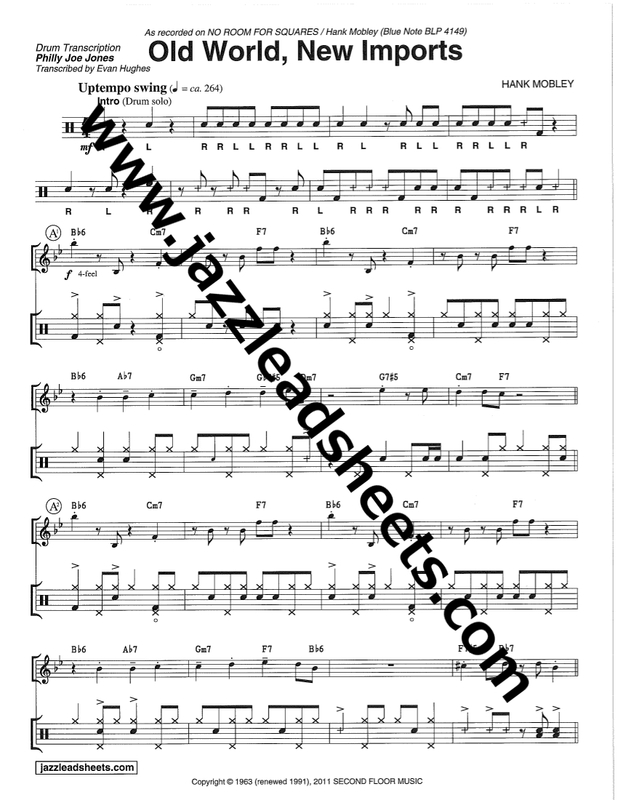 Everyone has to have their time feel totally together and know where all the different rhythm hits are in order to keep this clever arrangement from falling apart. 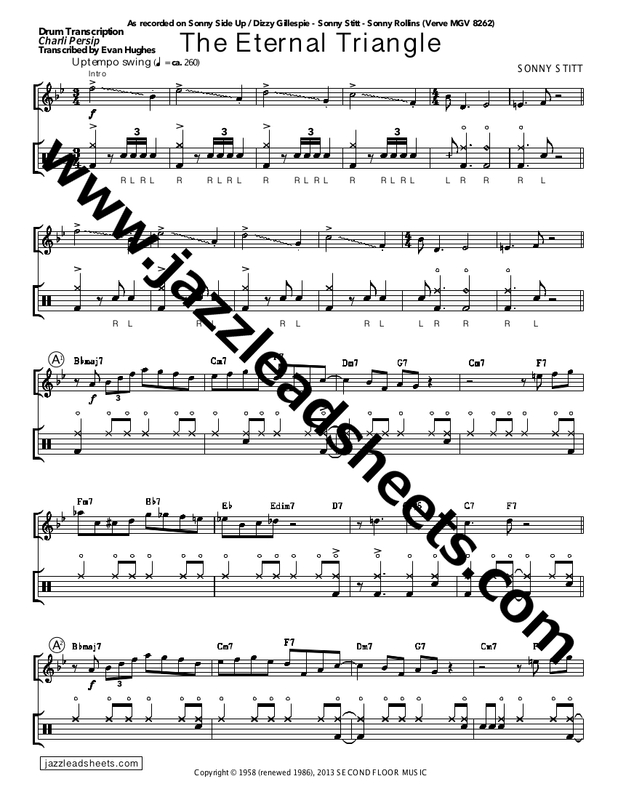 Everyone should learn the melody, so the lead sheet has the melody but also shows where the rhythm hits fall. This quintet had been together for 6 months before Clifford decided to drop this little rhythmic gem on them to see what would happen. This one will keep any group honest: everyone must feel the time together or you're in big trouble. Learning this tune would be a great exercise for any instrumentalist tryint to get their group sound together. 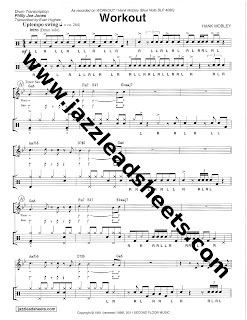 "Rudiment of the Week" will be a weekly special on www.jazzleadsheets.com. 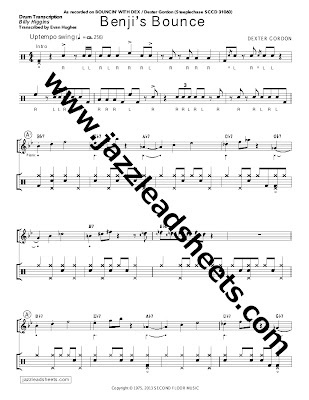 It will be a specific rudiment to work on for each week for all drummers who follow the blog. 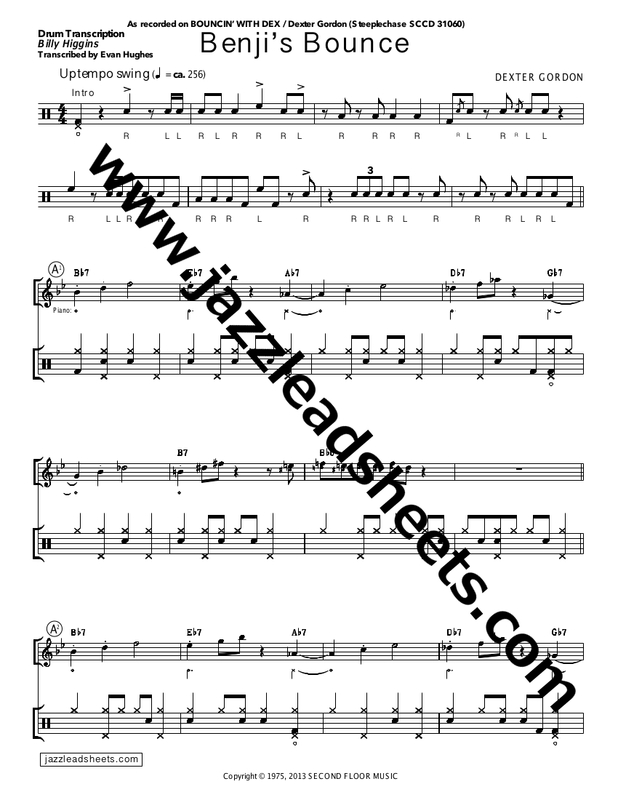 These rudiments are selected because they are particularly useful, challenging, or common. 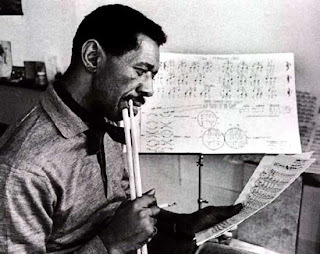 This is a rudiment that appears all throughout solo's by Philly Joe Jones, Kenny Clarke, Billy Higgins, as well as Alan Dawson's Rudimental Ritual. 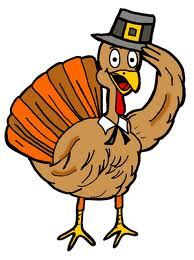 Remember to move it around the drumset to work on flexibility and dexterity. Keep shedding it and look for another one next week! 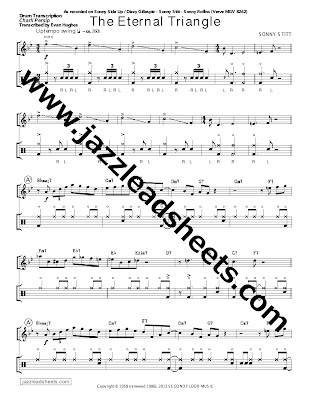 We are very happy to present this blog in association with www.jazzleadsheets.com. So please check it out!